range of cushion to prevent shock. 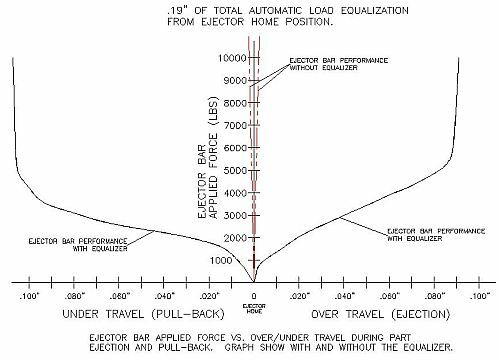 Equalization of variance in ejector lengths. Helps prevent unexpected machine down time. 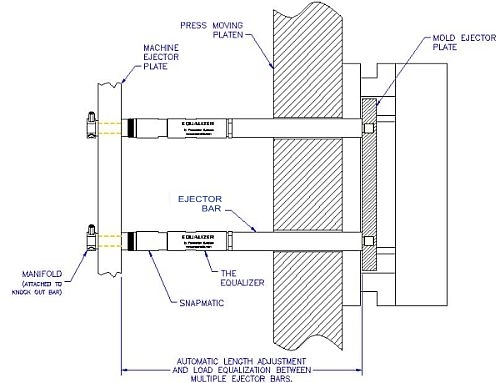 Pacesetter Systems' EQUALIZER is an Auto-Complaint device for automatic equalization and distribution of load when using multiple ejector bars attached to a single ejector (butterfly) plate. The EQUALIZER provides overload protection in compression and tension. Designed to protect molds, ejector bars, and the injection molding press from fatigue due to harsh forces present during part ejection and ejector pull back. Molding machines are typically equipped with more force than is needed for part ejection. The harsh condition may occur from mal-adjusted ejector home position. The EQUALIZER provides compliance up to .10" for the tension, and .09" for the compression. Constant hammering during ejection and "pull back" fatigues ejector components and eventually may lead to damage to the tool and/or ejector systems. The EQUALIZER offers a broad range of shock absorbing capabilities to reduce wear and tear. Wear and tear is always present but not always visible. In most cases when it surface, it is too late; damage is done, machine is down, and the cost of repair is predictably high. The EQUALIZER stand alone in offering you a combination of, "push or pull" compliance. The EQUALIZER is also designed for compatibility with our automatic Snapmatic ejector bar coupler.